After a lot of hard work, we have finally put our house on the market! Feel free to check it out House Listing Here. We often get asked if we buy homes, live on base, rent homes, or live in our van with having to move so often. We have moved over 15 times since Michael and I began our careers! We have moved 4 times in the past two years. Welcome to military life! We just smile and embrace every change. We always have a plan but it never fails to be modified at a moments notice. Moving is costly and a lot of work. We choose whether to buy, rent off base, or stay in base housing based on a number of factors. Every base is different on the amenities offered, their availability, if the house layout works for us, and safety off base. Because we’ve had so many moves, I’m just going to showcase our last few homes. In NJ, we lived first off base and then moved on base. We had to live off base first for a year until a house became available on-base. In NJ, our E3-E4 housing allowance was less than what we could find housing for in the area. We were eager to live on-base when it became available since it was the most cost effective route that yielded us the largest house for the money. With base housing you had to take what they would give you or be put back on the waiting list. We moved in a 3 bed 2.5 bath home on the base. We were on the end unit of a four-plex. We made a lot of amazing friends at this location. We set up the house to bring the quintuplets home. We had orders to be moving to a base in Northern Alaska. However, once quintuplets were found, the orders were cancelled halfway through the pregnancy since they were not equipped there for them. I went on hospital bedrest in AZ at 21 week pregnant. Michael dropped me off at the hospital and returned to Conner and work in NJ. I planned to stay in the Ronald McDonald house in AZ until they were all discharged from NICU since Michael only had 10 days of paternity leave. I would them take them via air ambulance back to NJ. Our plans changed though quick! The military though let us know one Thursday that we were moving to AZ. The next day, on Friday the moving truck arrived to pack up our house and bring it to AZ. Michael had orders. That night he stayed up fixing up the house for the final inspection on Saturday and left to head to NJ. From the hospital bed at 30 weeks pregnant with the quints, I rented a house using my computer without even seeing it! We needed somewhere to bring our babies home and also for them to deliver our stuff. We tried for base housing at first but they had no availability so we had to live off base. Renting was our only option since we needed a house within 4 days. At that exact same time, the house I had purchased at 18 years old in southern Illinois had renters move out unexpectedly. Michael stopped there on his way to AZ to fix it up and put it on the market to sell and/or rent. It was a great starter 4 bedroom/2 bath home in IL. It was 1750 square feet. I started having complications after 8+ weeks of heavy medications and surgery to stop preterm labor. I told Michael to hurry. Despite me being optimistic, I knew I was not going to make my scheduled csection of 34 weeks 1 day. Michael arrived to AZ and found me on Oxygen. I had developed pulmonary edema and gained 40 lbs of fluid in 4 days. I delivered 2 days later at 31 weeks 1 day. That was an expensive time. We had all the rental money/deposits for our AZ house, a mortgage in IL, and rent due on the base house in NJ on an E5 pay. We had no vehicle that fit our family and things were tight. However, we loved the house! The layout was amazing for us so we had lucked out. Our 1st AZ home! It was about 2600 sq feet. After a year of living there, a home on base became available, and the owners changed their lease terms (even though we had an agreement in writing before with them). We decided to move onto base. We were isolated and taking care of the quints 24/7 without help. Michael was working 60+ hours a week so we figured living on base would be a huge help logistically too. During this time, the St. Louis area market tanked further. We could not get renter’s or our house sold in IL. A year of rent payments and mortgage payments made life extra difficult. We decided to turn over the keys to the bank and do a deed in lieu of foreclosure. We were not behind in payments and needed to get a vehicle that could fit our family so this was the best family option. This devastated us emotionally and financially. It also lowered my credit by 40 points although it was still in a good range. We work hard for everything and have had full-time jobs since the age of 14 so it was hard to have that taken. We lived on one side of the AZ base housing for a year. It was great to be able to push the quint stroller and baby wear Gideon to the doctor on base or the commissary. We did not know I was expecting Gideon when we moved though. This house was just under 1500 sq feet. It was tight for the 9 of us but had a good layout. We then found out we were GA bound and had orders. We purchased a fixer upper house in GA without seeing it while we were still in AZ. We hoped for the best since the house had space and good bones. Michael left after a few months of being there for 10 months. I did not do many repairs since my hands were full with taking care of the kids. We tackled it hard though when he returned. We updated it drastically and made it perfect for us. This included finishing the basement. Find the Listing ad Here : We made memories here and I know you would too! Make it your new home :). 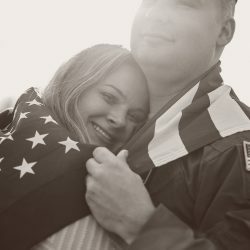 Michael took a new position with the military that requires him to be gone 2+ years, I resumed nursing school, we realized what family/friends were truly there for us, and other factors led us to another life change of our most recent move. *Front of our new home is not shown for safety reasons*. We will be showing interior pictures soon since I’m catching up. 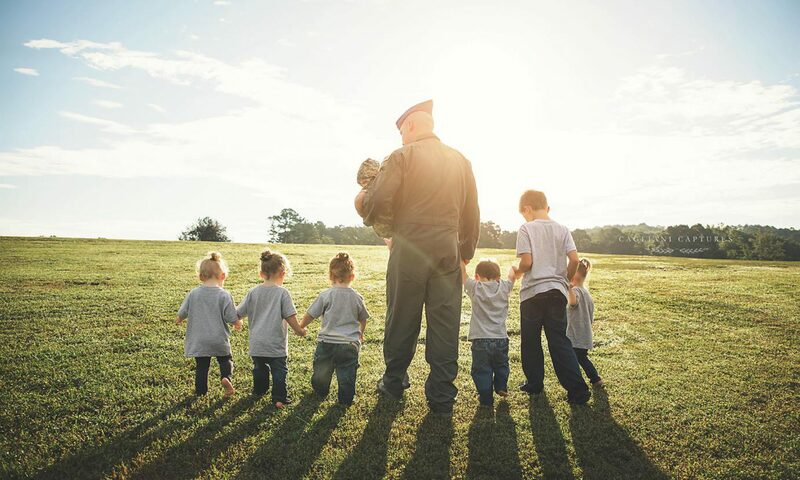 As you see depending on life, the safety of the base area, cost of living, the housing allowance, and housing availability dictates if we live on-base, off-base in a rental, or buy a home off base. We prefer to buy out of all of the options since it long-term is the best financial decision (you pay to actually own something). However, that is not always the most feasible choice for us at certain times. Previous PostPrevious January 2018-Lots of Changes for the Hoffman’s! Next PostNext Gideon’s 2 year old Cake Smash Pictures!